An overhead view of what the latest proposal for the renovated, expanded Cunniff School would look like. Parents and neighbors of Cunniff Elementary School got a look at what the school might look like after the renovation project is done, and they had some big questions and concerns about the loss of play area, drop off areas and more. Wednesday night the School Building Committee visited the school on the Westside of Watertown to discuss the upcoming renovation and addition of the campus. The board has upcoming meetings planned for Hosmer and Lowell schools. 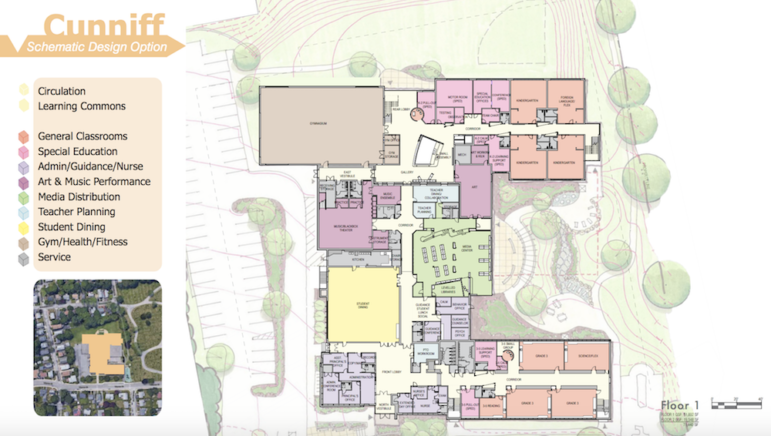 The current favored plan calls for keeping the front classroom wing at Cunniff, tearing down the one-story wing in back and replacing it with a two story wing. Along with classrooms, the project will add a full-size gym, expand the library, and create a music/blackbox theater space, said architect Scott Dunlap of Ai3 Architects. The classrooms in the existing wings will undergo major renovations. Parents were excited about the improvements that will come with the renovations, but had some concerns. Along with the designs, architects presented the sequencing of the three elementary school projects. Officials had looked at doing all three at once, but Dunlap said that would require spending $20 million on modular classes during the construction, and would make things much more complicated for architects, school officials and the community. The current plan calls for renovating Hosmer School first (where a new classroom building will be constructed), and then do Lowell and finally Cunniff. Students from those schools would go to school in Hosmer’s old classroom wing while their schools are renovated. 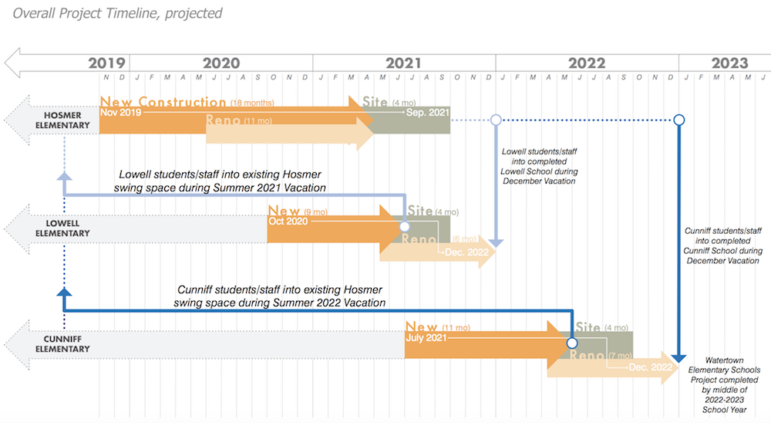 The timeline calls for completing all three schools by 2022. The timeline for the renovation of Watertown’s three elementary schools. Seeing their school last in line disappointed Cunniff parents, especially since their school has had the most problems with overcrowding and lack of classroom space. Parent Cara Mia Bruncati said that her children had to endure years where they had no permanent art or music room, and some classes had to meet in the hallways. “Why aren’t we second, before Lowell — with everything this community has gone through, and all the kids who cannot go here because there is not enough space,” Bruncati said. The plan is to have students out of their school for only half a year, and move them over the summer, Dunlap said. Because the work at Cunniff will take longer, the Lowell would fit into the second slot but Cunniff would not. The school would be updated so it can provide 21st century learning, said Superintendent Dede Galdston. It will also be able to accommodate 345 students, above the 307 at Cunniff had last January. The rooms will have updated technology and air conditioning, and the school will have places for students to collaborate in small or large groups. With all the additions and the expansion of the parking lot, however, the school will lose a significant amount of field space, Dunlap said. This concerned many of the parents at the meeting. The other recesses are spent either in the courtyard or on the playing field, she added. A floor plan showing the latest configuration fo the renovated Cunniff School. 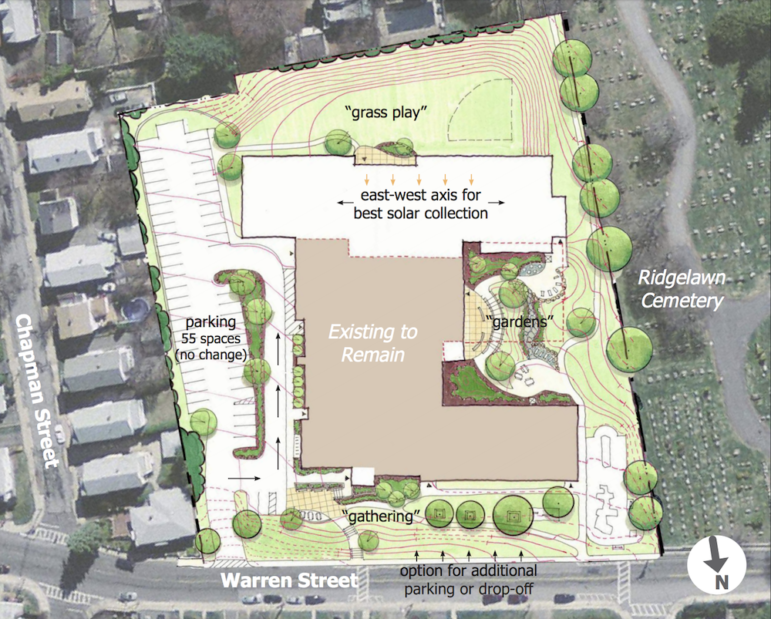 Although the field space would be smaller, Dunlap said that there would be an expanded courtyard on the west side of the school (which would include the school gardens) and a larger gym. Neighbor Curtis Whitney said the school already lost its blacktop play area. He liked one of the other design options that would build a whole new school on the back of the school property, and leave a large green space in the front. Dunlap said that would be a much costlier option, and would require students to be out of the school longer. Whitney also suggested moving some of the parking underneath the building so not as much green space is lost. Parking and drop off/pickup areas, are one of the concerns of the school, too. The plan calls for increasing the parking area to accommodate enough parking, and create a new drop off/pickup flow in the lot, Dunlap said. Parents were skeptical about using the parking lot as a drop off area because it is hard to get in and out of the parking lot during the busy times. Dunlap said architects looked at extending the drop off area in front of the school, but said it could never be long enough for all the cars. “When it is full, people start double parking, then you have kids moving between cars,” said Dunlap, who added that the drop off time will never be calm, but he hopes the new design improves it. Town Council President Mark Sideris, who chairs the School Building Committee, said the design team has been taking notes on their questions and concerns and will see what changes can be made. “Nothing is decided yet. A lot of things have been talked about tonight will be discussed again,” Sideris said. Similar meetings will be held at Hosmer School (Wednesday, Nov. 14 at 6 p.m.) and at Lowell School (Wednesday, Nov. 28 at 6 p.m.). See the entire Cunniff presentation by clicking here.